In a previous post (4 years ago) I brought your attention to the existence of huge amount of water in Earth’s mantle. Quanta magazine recently reported on the latest news on this front: The Hunt for Earth’s Deep Hidden Oceans. Here’s a diagram from that article summarizing the main ideas. Thank you Quanta magazine. Thank you Marcus Woo for this wonderful article. 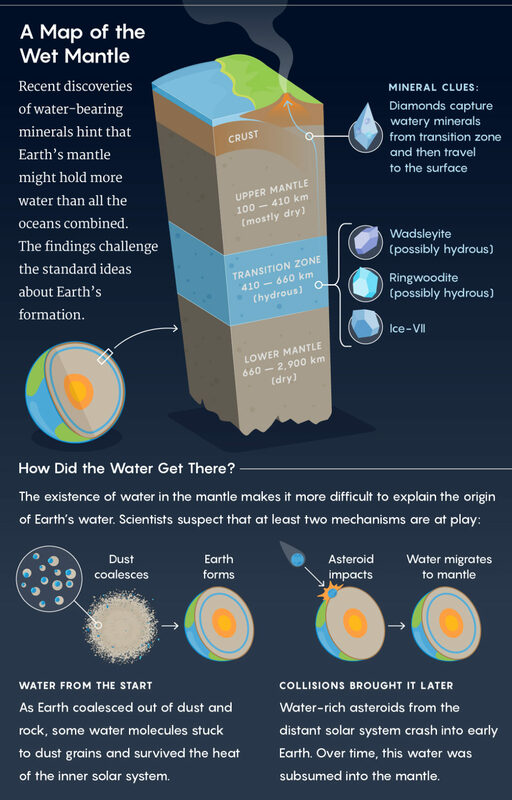 Recent discoveries of water-bearing minerals hint that Earth’s mantle might hold more water than all the oceans combined. The findings challenge the standard ideas about Earth’s formation. How Did the Water Get There? As Earth coalesced out of dust and rock, some water molecules stuck to dust grains and survived the heat of the inner solar system. Water-rich asteroids from the distant solar system crash into early Earth. Over time, this water was subsumed into the mantle. I have worked as a physicist at the Fermi National Accelerator Laboratory and the Superconducting Super Collider Laboratory. I am a volunteer for the Renaissance Universal movement. My main goal is to inspire the reader to engage in Self-discovery and expansion of consciousness. This entry was posted in geology, geophysics and tagged Earth's mantle, oceans. Bookmark the permalink. How many books in major libraries? Is there a particle that interacts with muons but not electrons? How long does it take to reach the bottom? Can astronauts see the stars by the naked eye in space? How long astronauts stayed on the moon?